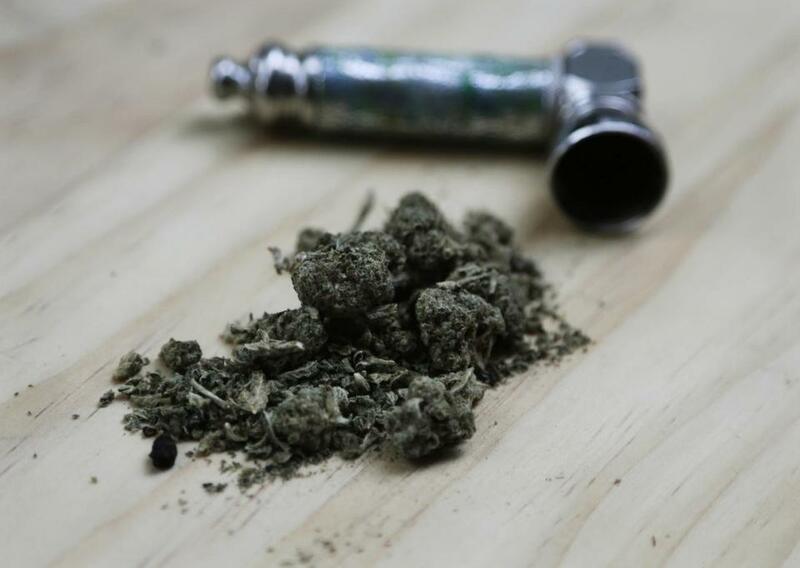 Marijuana and a pipe used to smoke it are displayed in New York in June 2018. If you’re acting loopy during a traffic stop and your car smells like pot, police can arrest you for driving under the influence of marijuana. That was a finding contained in a ruling Monday from the state Supreme Judicial Court, amid the backdrop of a booming retail marijuana industry that launched in Massachusetts in November. The ruling concerned a defendant, Mark J. Davis, who was arrested for alleged impaired driving in Brighton in 2015, after State Police pulled him over for speeding and operating erratically on the Mass. Pike. Davis was acquitted of the drugged driving charge at trial, but he challenged the lawfulness of the arrest on appeal, because troopers had impounded and searched his vehicle. They found cocaine, oxycodone, and a handgun inside the car, leading to additional drug and gun possession charges, records show. A jury convicted Davis of drug possession but acquitted him of possessing the gun. As for the initial arrest for drugged driving, the SJC said it passed constitutional muster, based on the arresting trooper’s observations at the scene. That search turned up oxycodone and cocaine in a locked glove box, as well as a loaded Smith and Wesson .380 handgun in the trunk. Jurors convicted Davis of drug possession after his trial lawyer told them, “Go ahead and find him guilty of the drugs in the glove box. Those are his,” the ruling said. But the jury bought the lawyer’s argument that impaired driving and gun possession charges couldn’t stick. But Monday’s SJC ruling means the conviction for drug possession stands. The opinion provided clarity on factors police can cite when arresting someone for driving under the influence of pot. “We acknowledge that it is often difficult to detect marijuana impairment, because the effects of marijuana consumption ‘vary greatly amongst individuals,’ ” the opinion said.